Even though I wash most wool before spinning it, I still wash it when I have it all skeined up. I tend to spin alpaca before spinning. SO, here is how we wash our handspun yarn- easy peasy! 2) Fill washer (or sink) with warm water and a dash of soap. 3) Add yarn and let it soak- no time limit. Sometimes I forget I started mine out. Oops. 4) Swish the yarn about a little, then spin out or drain. No agitation if you are using a wash machine. 5) Refill washer (or sink) with warm water and repeat. 6) Spin out or drain. 7) Remove skeins and hang up to dry! Wa-la! *You can also dye the skeins prior to washing- or after. Sky's the limit! After washing wool here at the farm, we also send out for machine carding and blending into beautiful roving! We send wool to our good friend Shari at Morro Fleece Works. 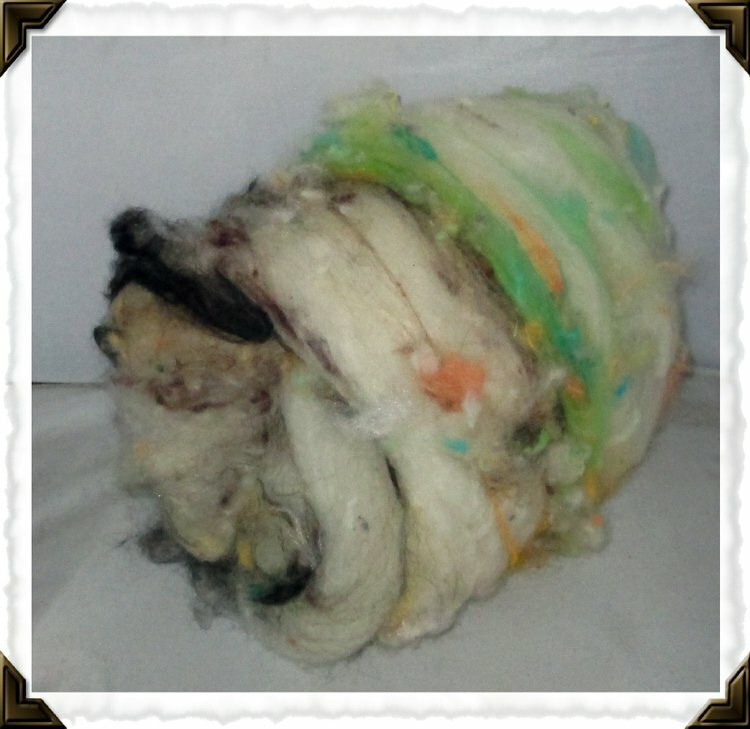 The the fiber is carded into beautiful loose or pin drafted roving. She is wonderful, has been good to us/our fiber for a long time now-we adore her. 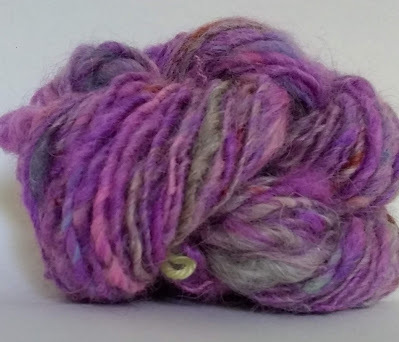 The pin drafted roving is one step further than loose roving and allows us to run roving that has different colors side by side- fun and easy to spin!! Thank you Shari! If you don't spin yarn, I love special orders. Email the sheep any time and we'll have you all set to go with your next woolie yarn project! We do not believe sheep shearing is inhumane if done correctly. Shearing sheep each year is one of the most important parts of their care. Left unshorn, sheep can have a myriad of health problems that are all equally horrible—from fly strike to heat stroke, sores and more--even the inability to move correctly when the fleece tangles and matts around their legs. Imagine never washing your hair or cutting it- that would be pretty gross right? It is the same for sheep. Pictured is our Gabriella, a Cotswold sheep. She was a sheep with a lot of wool growth on her face. It is so very cute! However, if she wasn't sheared every year AND her bangs kept trimmed the rest of the year- she would go 'wool blind.' That can lead to a sheep becoming permanently blind if left unattended. Shearing is accomplished by setting the sheep on its hinder and carefully turning the sheep to shear the entire fleece. He is careful not to cut them with the clippers and the whole ‘ordeal’ is over in about 5 minutes or less per sheep. The gift in a shearer is definitely personified by Ryan, he has a unique way of handling the sheep that keeps them calm and comfortable—cradling them so there are not any injuries or traumatic experiences…. Years ago we had Angora and Pygora goats. Each spring and fall we sheared them ourselves—they are easy to work on and require nothing more than a scratch on the head to keep them standing still for me. We also have several sheep who we shear that are just easy enough to do, keeping them from being traditionally sheared to keep the stress off their once broken limbs. Caring for wool is easier than you may think--and much more forgiving than people often give it credit for! A simple way to wash an item or yarn is to fill your sink up with luke warm water and a dash of dish soap, gently add the item/yarn and let soak. Then drain the water, set the items into your clothes washer to spin the excess water out. Then fill the sink with lukewarm water one more time to rinse the item, just set it in, let it soak, then back to the washer for spinning out the water! If you are storing an item long term, wash it before you store it, we recommend in a sealed ziplock type bag, and add a dryer sheet or lavender sachet to keep it free of moths--you can also tuck things into your freezer just to be safe, they will pop out when you need them all nice, fresh and ready to be worn or used! Nothing to it!! Fill washing machine with very hot water. Gently add wool (generally up to 5 pounds of wool). Let soak for 45 minutes. 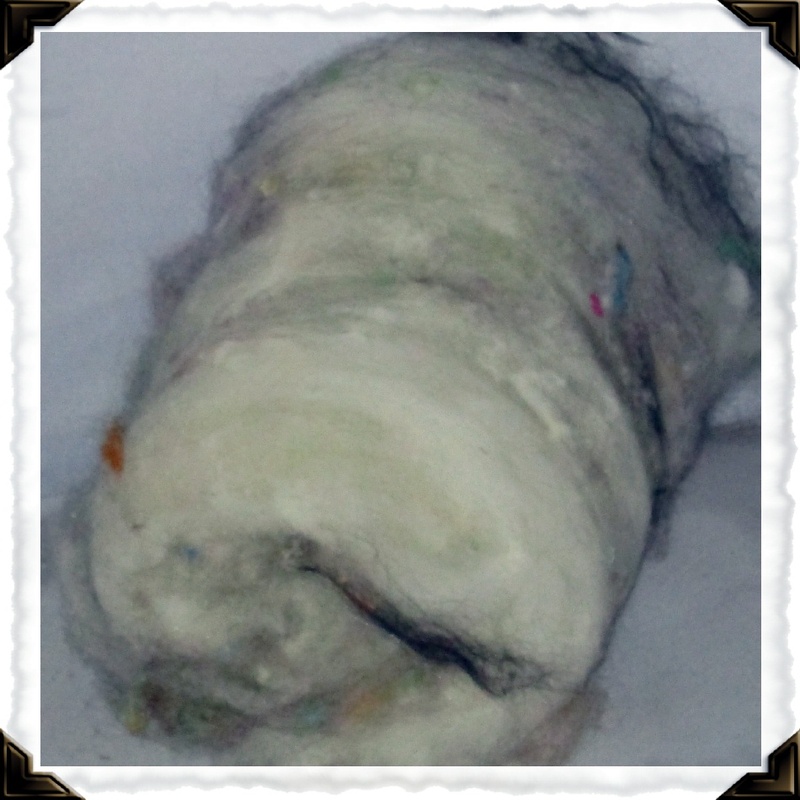 Even though it is tempting, do not move the wool around while it soaks or you could end up with a washer full of felt! Hot wool felts very quickly! When the water has drained, turn washer to spin cycle, close lid and allow water to spin from the wool. Remove wool, wipe out washer. Refill washer with hot water, turn machine off. Gently add wool, allow it to soak for 1 hour. Repeat step #3. This process should give you a nice clean, fluffy wool that is ready for the dye pot or let it dry on a screen outside as it is. If you feel it needs further washing, just repeat the two steps. Some wools that are heavier in lanolin (such as Merino and Rambouillet) do require more washing to completely remove the lanolin. To wash smaller amounts, just use the same procedure in your kitchen sink, with a smaller amount of soap. My hubby might ask, what type of sheep DON'T we have! ha! Again, a varied group lives here, including Suffolk, Lincoln cross, Romney cross, Merino, Rambouillet, Shetland, Jacob, Corriedale, Wensleydale, Border Leicester and more! We do not have a policy about what type of sheep live with us, they all have beautiful wool and are happy to be here and that is all we ask…. Our younger sheep live in the west pasture and call the ex-dairy barn home each night. Our elderly/special needs sheep live on a smaller pasture near our house. Their home is a nice warm spot in our pole shed. The little group moves over into the dairy barn in the winter. That barn is around 100 years old and built to be warm! While the coyote factor is scary for any flock owner, we really seem to be able to co-exist peacefully for the most part. We love to hear them calling at night--but prefer they stay on their own side of the fence! We have replaced almost the entire perimeter fence with woven wire panels that are strong and tend to keep the coyotes from entering the pasture. They have so much room to roam here it does work so far. 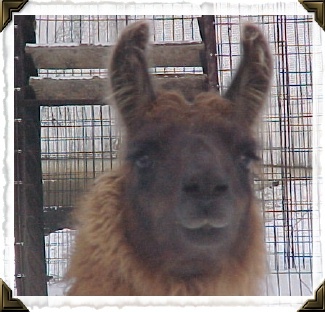 We believe they have a place on the earth so have chosen to go with llamas and the dogs to keep our flock safe. SO far so good and hope the coyotes stay on their side of the 'world'! ha! I would have to say my life with animals started with my beloved Crissy—a little unwanted foal who needed a home when I was 11. My parents could not afford a horse at the time, but decided to go ahead and adopt that sweet little red baby with the white nose. They gave me a precious gift in more than one way--they not only made their daughter the happiest girl in the whole world but I learned to have compassion for animals and a love of working with and caring for them. I am not sure my parents always looked at it as a gift, there was lots of driving to the stable and shows on weekends once Crissy was old enough to be ridden but they unfailingly supported my efforts and loved Crissy too. I worked hard to help provide for her—whether it was cleaning stalls or riding horses for other people. I was lucky to have Crissy as part of my life until she was almost 30—we lost her a few years ago but I still catch myself looking for her when I go outside to visit our animals. I will always miss her horribly but I think my life with Crissy set the tone for the rest of my life—she was the sweetest, most patient creature on earth and certainly more than returned my devotion to her…. Taking care of animals is a wonderful way to spend your time. They give so much back to you and are truly a blessing! I also spent many years as a veterinary technician and working with several rescue groups in the past so my background in rescue and care of animals has been a part of my entire life. 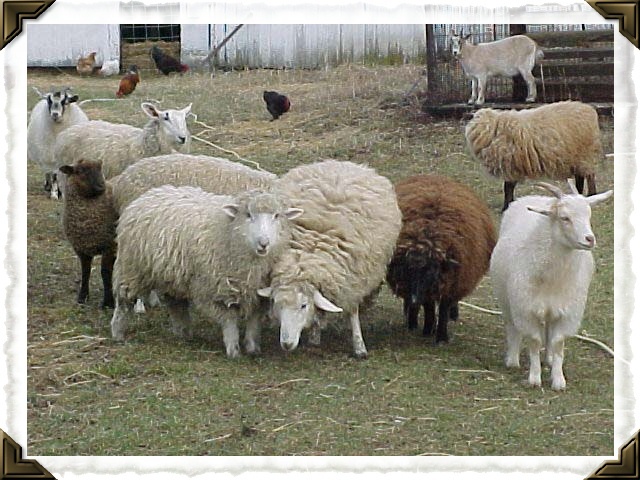 Long story short, the sheep part of our lives began with one black sheep—our Woolamina! Someone gave her to me for a birthday present as a joke--(I always said I wanted a black sheep) and you can see what happened to us since!